Pregnant Princess: Holidays and 21 week scan. I haven't written for a while, so I'll start with our lovely holiday at the vaal. We had so many public holidays so we went up for 10 days. We left after work on the Thursday afternoon and arrived late that night at the freezing cold Vaal. Mom came through the next day and we spent the next 10 days surrounded by wonderful friends and family. Was so wonderful to see everyone. The only thing is that it was so cold! I was very ready to come home to Richards Bay where the coldest it gets to is about 16, and thats first thing in the morning when I'm in bed anyway! I started feeling Lily moving when we were up there, she had moved once or twice before but not every single day, as soon as we hit 20 weeks she started moving loads! Especially after I ate anything- especially anything sweet! 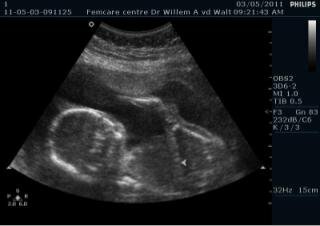 We had a scan the day after we got home, and saw our little girl properly for the first time. The doctor had to do the organ scan to check all her insides were developing properly and all that (which they are). She has moving loads during the scan, I don't think she likes being poked and prodded! 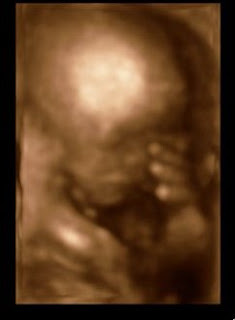 We finally got a good look at her face, after the doc shook my tummy! She was lying with her arms thrown up over her head and eventually moved them and he snapped the pic. I cant believe shes only 20 or so cms but is a complete person. She looks just like Shaun, has the same mouth and I can just see him in her- hopefully when she comes out she has some of my characteristics to, but her daddy is very handsome so Im not complaining!